Ministry of Agriculture, Forestry and Fisheries X Hatsune Miku collaboration takes the world on a Japanese food adventure! 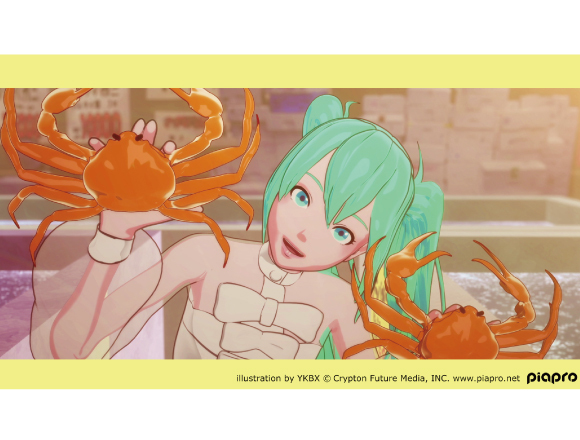 Japanese food and Japanese culture X Vocaloid singer Hatsune Miku – a new promotion video featuring a Miku’s voice has been released and can catch it on the official YouTube channel of the Ministry of Agriculture, Forestry and Fisheries. From 14th March 2017, this song will be made available on JOYSOUND and DAM karaoke with the official video included. Every corner of Japan is rich with a diverse food range. Over the years a unique food culture has developed in Japan. Recently, many foreigners have started to express their growing desire to enjoy authentic Japanese food in its country of origin. This is precisely why the promotion video was made. This video invites the audience on a journey with Miku, following her as she visits a variety of places in Japan to enjoy a vast range of delicious foods. This video was directed by YKBX, who was also the director of a Miku’s vocaloid opera “THE END” and has been active in the fields of illustration, graphics and more. Nothing can beat YKBK at what they do best! In this song, the Japanese word “delicious” (oishii) has been incorporated with a strong tempo and is worth a listen! ■ Related article: Hatsune Miku will now make doing your PC work less stressful! Giant limited edition Hatsune Miku cushion arrives!